Antares Energy signed a Letter of Intent to sell 32,297 net acres of Permian Basin acreage for $300 million. The acreage includes 15,500 from their Big Star project in southern Martin County, 12,100 from their Northern Star project also in southern Martin County and 4,697 from their Southern Star project in Howard and Martin Counties. Included in the sale is approximately 2,500 boed. Metrics for the sale are $9,300/acre and $120,000 per flowing barrel. This is a good comp for Lynden Energy as there aren't many other small cap junior oil producers. 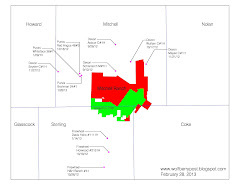 Lynden Energy has approximately 6,482 net Wolfberry acres in Martin, Howard, Midland and Glasscock counties and 34,150 net acres at their Mitchell Ranch project in Sterling and Mitchell counties. Keep in mind that Lynden also sold 630 net acres in Martin County for $25 million ($40,000/acre) to Breitburn in December so at least some of their producing acreage is worth upwards of $40,000/acre. Also, Keith Schaefer from the Oil and Gas Investments Bulletin had a nice article about Lynden in his recent bulletin. He claims the area around Mitchell Ranch is getting drilled up "with some success" and Mitchell Ranch is "pretty darned near smack dab in the middle of the new Cline Shale play." His potential valuation numbers are pretty much in line with what has been previously mentioned on this blog which means Lynden has the potential for a much higher stock price. Five large block trades have occured since 6/19 equalling 5.25 million shares. These trades have not been listed as insider trades by JVL Advisors so it's likely that another investor has been making these purchases. It's good to see that another investor is enthused by Lynden's story.